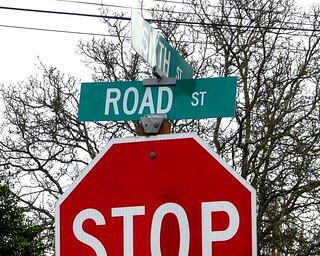 They couldn’t come up with a better name than "Road Street"? Is it located in City town? Hi, I’m an admin for a group called Street Signs – Funny or Unusual, and we’d love to have this added to the group! Oh my word. i really want to live on that road. or on that street. or just on road street. Too funny ……. keep up the great "sign" series …….. I’m loving it!!! i always hoped to find Unpaved Rd or Paved St. Some day. Pizza guy: "How do we get to your house?" You: "Drive on Lane, then turn at Road."